Star New York Giants receiver Odell Beckham Jr says "s*** ain't right" with the quad injury that has kept him out of practice this week. 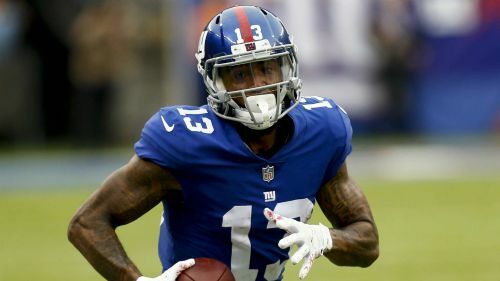 Beckham says he suffered the bruising injury late in the Giants' November defeat to the Philadelphia Eagles and he was on the sidelines as New York beat the Washington Redskins last week. The injury had not been listed until two days before that game. The 26-year-old has since undergone further evaluation and was absent from practice on both Wednesday and Thursday ahead of Sunday's meeting with the Tennessee Titans. Asked to clarify his injury, Beckham told reporters: "Whatever you want to call it, s*** ain't right. "We just went in, just took a scan to see everything. It's doing much better than it was. We take it a day at a time. I honestly don't know until I see what they say. "It's been getting better each and every day, we just have to figure out what it was. It happened on the last play of the Eagles game. Whatever it was, it's been ever since then just lingering on. I just played through it. "But the way it was feeling, from Friday, to go check it again, to see if there's progress, to see if it's the same thing, I felt like that was the right thing to do. You have the resources, you might as well use them." Beckham has contributed significantly this season, although the Giants are bottom of the NFC East. He has caught 77 passes for 1,052 yards and six touchdowns through 12 games. He also has thrown for two touchdowns.